Since 1988’s High Hopes came to American audiences, the British filmmaker Mike Leigh has been considered one of the most dynamic curiosities in contemporary cinema. Starting with a cast and no script, developing characters’ entries lives before beginning to write one word, and, as this interview shows, condescending to members of the general press, Mr. Leigh makes films that truly touch on the entirety of human emotion, whether in its darkness or exuberance. 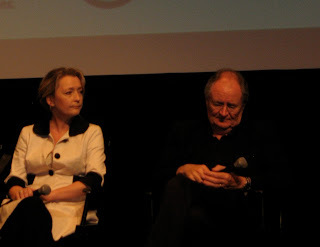 Another Year, his latest film, finds a bit of both, which stars Jim Broadbent and Ruth Sheen as a happy married couple that play a surrogate mother and father to the people that enter their homes, most notably the talkative boundless Mary, in a career-turning performance from Leslie Manville. At the NYFF press conference, Mr. Leigh sat down with both his cast and his producer Georgina Lowe to discuss the creation of his film, if also to deride some critics about writing about him. Leslie, Jim, and Ruth—You’ve all worked with Mike over the years, in leading roles. On Vera Drake and Happy-Go-Lucky, you had people who hadn’t been in lead roles before with Imeldas Staunton and Sally Hawkins. What has changed over the years with the working method? Leslie Manville: I don’t think it really has changed over the years. I suppose it’s more about the time you had to make a film as opposed to the early days when Mike was making films for the BBC and Channel 4. So there’s more time now. But really the way we work together and collaborate and create the film hasn’t really changed. Jim Broadbent: Absolutely the basic structure remains very much the same. I’d say the real only change, having done it quite a few times before. The process isn’t as much as a voyage of discovery, as it kind of was in the early days. The actual working has been very consistent. Ruth Sheen: I think the main thing is that we’re all older. Sheen: The process is the same. Broadbent: I thought you were going to say older and wiser and more depth and life and spirit…As we’re older, the filling in the back story for the characters takes a lot longer. When we were first working with Mike, I was in my 20s, and the characters were in their 20s, so it didn’t take long to fill in the years. But when you get to 60, it can take quite a long time. What was the germ of the film? Did you start with the relationship between Leslie’s character and Jim and Ruth’s, or was it broader than that? Mike Leigh: The actual germ of the film is impossible, because I can never talk about “a germ” because these films, and this film is no exception, come out of ongoing occupations at times. Apart from anything else, as far as I’m concerned, having made Happy-Go-Lucky which is pretty much about young-ish people, I wanted to start from where we are. It’s about a lot of things, this film, and it’s hard to talk about it in a simple way from that. But it comes from a joy and pain of life I wanted to show. As to the actual mechanical second part of the question, as you know from the film, Mary’s relationship is something that’s happened much later in their history. In fact, the chronology is always logical. We actually started with Tom’s relationship with his brother Ronnie, and the first actor I started working with at all, is Ronnie [David Bradley] because he’s some years older than that. So it was the logic of their lives. Thus Gerry entered their lives quite a bit down the line. While that was all being developed, I was inventing this horrendous life with Mary. In the film, Tom and Gerry’s home seems like a place of nurturing, very similar to their garden. Was this a theme you wanted to design? Leigh: It’s not really a question. You’re pretty much defining one of the central things the film is about. It’s about nurturing, it’s about caring, it’s about those who need and those who are able, in various ways, give them what they want. And then there’s a moral dilemma of where you draw the line, where do you protect yourself from all of those. That’s what it’s all about. And of course the relationship between nurturing and people and their relationship with the Earth, with the environment and the planet is implicitly there, in a way their organic people. I had a notion that I wanted to deal with environmentalists but you can’t make a dramatic film about environmentalists. It’d be turgid. There seems to be a similarity between Mary and Beverly from Abigail’s Party. Could you talk about that relationship? Leigh: Well I think they are very different kinds of films actually. I don’t think there’s much worth discussing that relationship. Manville: It’s not certainly something we would think of doing. Leigh: We’ve never done that before. Manville: No we haven’t…maybe we should. But it’s certainly something we hadn’t thought of replicating. It’s not the agenda. The agenda is to create a fresh new character obviously and she where she goes. But you saw similarities than that’s your prerogative. Leigh: I apologize, but I feel a bit of a cul-de-sac question really. I can’t really see the connection, and it’s never occurred to us, and I should give it no more thought. When did you develop the idea of the seasons to have these four very specific vignettes at these four very specific times? Leigh: Well it’s integral in the conception of the film really. It’s hard to think of “when” it was. It seems like a logical thing to do really. Leigh: Well with all due respect, you can ask the question about any novel, painting, piece of music, etc. The fact is the job is to create a dramatic fiction, a piece of cinema, a finished piece of work, which has a beginning, middle, and end, hopefully has a meaning, and for the audience, things to go away with etc. So, the process with anything, not just film, is that you distill that thing which is contained in the final definition, the final frame. It is true that it could go on. It just isn’t. I think the question that I understand, you are asking it because there is this sense of a free wheeling, fluid, creative, investigation from what we do. But that’s what we do with all art. All art is a synthesis from improvisation with order. Every piece you writers will write you’ve got fluid ideas and you’ll distill it down and you eventually arrive at a finished thing, and once it’s done you revise that. That’s the journey you’ve done, and the piece of subject is very much a piece a marble, and you don’t worry about whether it could have otherwise been, or worry about where all the bits. The journey for me, and I think for all of us, is we do a great deal of depreciation, and arrive at this very finished piece of work. And don’t forget—your question is sort of to do with the acting. But it’s not acting. It’s about cinematography. It’s about editing. It’s about design. It’s about the score, the music. All of those things, the title, the mix of the film, they all move forward toward a final definition of a distilled artifact. That’s the thing we move toward. What matters is the thing that matters. So there’s no question that it could go on. And we’re not interested in that. That is something that should currently be going on in the mind of the audience. (Film critic Glen Kenny posed this question) I was trying to contrive the most irritating question ever—Did you put those themes in on purpose? I thought I’d ask something actually useful to the producer, which is, what is the specific logistical challenges of accommodating the particular process by which Mr. Leigh and the actors work on these projects. Georgina Lowe: I think the hardest is getting the proper time needed to get these projects running with the opening for time and space for rehearsals. We have to approach it with a very flexible attitude when a performer starts shooting, but we get information all the way through rehearsals so we get a lot to work on. We were very lucky to have these collaborators that come back time and time again so they’re very used to the process which does cut some time out. Leigh: I mean you can’t do this kind of thing without a producer. I have somebody who is overseeing it and anticipating my every move, and sees the impossible things I want to do, like the four seasons. We shot the film in twelve weeks, so apart from the dramatic and emotional content, to shoot the four seasons took a lot of precise planning. The characters you play for very nuanced women of a certain age, and different ages, and we see certain faces on real women, as old as I see. Can you talk about what it is like to be involved on this project at this moment in your lives? Sheen: First of all, I’d say this is the only face I’ve got. For me, as an actor, it’s very creative and very fulfilling. You take a full role in the whole aspect of the job. So you have a saying in that house where they live, what’s in that house. You have a saying in your character, their relationships. You have a saying with the whole thing. You have a saying in the foundation…Being old you mean? It’s all right. It’s the same as a job. Manville: I think it’s nice, and rather good, that we show women in their age. You see it how they are. Obviously Ruth and I don’t do anything to cute up our faces off screen. I think that’s what your question is about where in Hollywood, everyone is made to look twelve. It just doesn’t enter into it really. We are making films about real, fully-rounded people. We wouldn’t be working with Mike, the way that we do if we weren’t comfortable in our own private skins. Leigh: I suppose what you’re really asking the feeling of dealing with women contemporary to that. Lowe: Your female characters are always wonderful. I think we all totally believe in what Mike does and that’s how we got to where we are why we continue to work with him basically and I’ve been working with him for quite a few years now—since 1990—and these guys before that. Leigh: I see that your question is about dealing with middle-aged women in a way regular films don’t, or when films do they don’t deal with them in a regular or accurate way. I think it has to be part of my sensibility…There are many ways of rationalizing or explaining what I do and how I do it, but apart from anything else, I couldn’t do what I do by sitting in a room with a Word Processor, and writing a traditional script, and then looking around for actors to do it. I just wouldn’t now how to do that. I can do things and go places because of the critical collaboration of all the actors, which I wouldn’t be otherwise able to do. One of the most important, specific places I feel I can go, which I feel is truthfulness, is the experience of women in depth, because of the involvement of the actress I’ve worked with. It’s just that we happen to do it without a script. There’s a constant, not only input, but accuracy check, at all times on all kinds of levels. I couldn’t make it all by myself. Broadbent: This is the reason is why we work with Mike anyways. The films I enjoy seeing are the ones in which show lives I was unaware of and cultures. And if I see a sanitized, tidy-upped, I don’t see the film because its all sanitized and tidy-upped. So the joy that we get is something that is hopefully more real and revealing to an audience. Something that they recognize that they were slightly unaware of. You are well known for improvisational work well in advance. I’m wondering about how some of those changed during the process, such as Imelda Staunton’s cameo in the beginning, and later, Carl, the son, who might have been bigger at some point. And I’m wondering if there were characters that disappeared completely by the time you were ready to shoot. Leigh: Absolutely not. The job is to make the film with the people are in it. Anytime, someone’s disappeared historically, was if they turned out to be terrible. But this film contained none of that…The reason there is only the amount there is of Imelda Staunton’s character at the beginning of the film is that it has the role of introducing Gerry, and Gerry doing what she does professionally early on. But that whole sequence is an emotional prologue to the film, and rather than start with Tom and Gerry and make you feel comfortable, by plunging you right into the depths of this woman’s pain, it sets you up for things that will follow. But thirdly, there’s absolutely no way this woman’s coming back for therapy, or counseling, or anything. She just wants a good night’s sleep. And you know when she walks out that door Gerry’s not gonna see her again. Dramatically, the amount you see of Carl is the amount you see, because that’s in the nature of what happens: he storms in, creates a fuss, and leaves, and that’s the end of that. In fact, Martin Savage is a wonderful actor, and we did lots of investigation with him, which is referred to when they talk about how great he used to be, and how he was such a good kid. But the reality is in the actual narrative that is all that requires. As I said earlier, it’s about the needs of the drama, the needs of the film, it’s about the end product. The preparation is simply just that, it’s preparation. During this film, I kept seeing the films of Eric Rhomer, whose films were very conversational. Do you have any interest in his films, or are there any directors that do inspire you? Leigh: Eric Rhomer lately departed sadly. We had mutual respect, and I liked his films a lot. And I know his season films. I have to say I forgot all about those while I was making this, and I don’t take it as an influence and I think his films as ones that I very much admire and like. I think he made a very different kind of films than my own, which I thought were more, acerbic and perhaps more socially critical of the life on the whole. If you don’t mind I won’t go into the lists of influences because it would seem not worth to take up the film here.